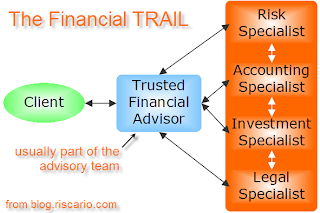 Accountants are the most trusted financial advisors. Unfortunately, they are rarely experts in how the tax advantages of life insurance can help their clients. That's fine because they were at least asking. That got me thinking, about the roles of different advisors in today's specialized world. One of these four --- typically your accountant --- is the trusted financial advisor, the one you consult before making an important decision. This happens most often in small businesses. Many sports are based on teams. However, your specialists probably work separately, depriving you of the advantages of a true team.